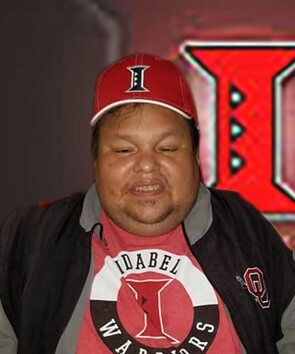 Anthony Belvin, 46 of Idabel, passed away March 30, 2019. He was born August 18, 1972 at Talihina, Oklahoma. A faithful member of Myrtlewood Baptist Church, Anthony loved getting to go to services. He loved interaction with people and was a proud Sooner and Warrior Fan. Whether rain or shine, he was at the Warrior home games, cheering on his team. He also liked to pretend he was quarterback for the 49’ers and play catch. WWE Wrestling was another sport Anthony loved along with Nascar. He loved his nurses racing him through the halls of the nursing home in his wheelchair. Anthony liked to collect cans and travel through Idabel carrying his football waiting on a good game of catch. He is survived by his sister Kaoda Belvin of Broken Bow; aunt and caregiver, Verna “Skeeter” Washington of Idabel; aunt, Marthella Padron and husband, Benito of Pittsburg, Texas; uncle, Glenn Washington and wife, Heather of Idabel; nephews, Dakota Wilcox and Keiffer Wilcox both of Haworth, Hunter Williston and Jonovan Carterby both of Millerton; special friends, Phillip Smith and Randy Pondexter; numerous cousins, other relatives and a host of Warrior Nation friends. He was preceded in death by his mother, Lecreata Billy; grandparents, George and Ruby Washington; brother, Justin Carterby; uncles, J.R. Washington and Jamie Washington; and his 2 faithful pets, D-O-G and Little Justin. A celebration of life service will be held at 2:00 p.m. Thursday, April 4, 2019 at the Clardy Funeral Service Chapel with Nelson Wesley and Stanley Shomo officiating. Interment will follow in the Kullio Tuklo Cemetery. The family will receive friends Wednesday, April 3, 2019 from 5:00 to 7:00 p.m. at the Clardy Funeral Service Chapel.